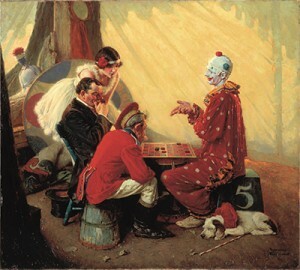 Norman Rockwell (1894-1978), Checkers, 1929. Ladies’ Home Journal, July 1929, p. 11,Oil on canvas, 40 1/2″ x 44 1/2″. Norman Rockwell Museum Collections. NRM.1976.01. Stockbridge, MA, August 13, 2018 – Norman Rockwell Museum’s Thursday evening lecture and performance series continues through the month of August with art talks and a musical performance. The Thursday series, held at 5:30 p.m., is inspired by the Museum’s current exhibition Keepers of the Flame: Parrish, Wyeth, Rockwell and the Narrative Tradition. On Thursday, August 16, Keepers of the Flame Curator Dennis Nolan and Norman Rockwell Museum Chief Curator Stephanie Plunkett will present a look at the art and lives of Maxfield Parrish, N.C. Wyeth, and Norman Rockwell, three of the most popular illustrators of the twentieth century. Complemented by original works, currently on view in the exhibition, the gallery talk will explore the artists’ unique experiences and signature styles, which have inspired many artists and viewers through the decades. The following Thursday, August 23, the Museum will welcome back local a cappella group Quintessential for an evening of art music. The group, which includes tenors Al Thorp, Jay Wise and Jim McMenamy, and bass/baritone David Anderegg, will perform songs that tell stories and complement the themes of the Keepers of the Flame exhibition. The series concludes on Thursday, August 30, with a look at The New Woman in American Popular Culture with author and Rockwell Center for American Visual Studies Fellow Barbara Tepa Lupack, Ph.D. Dr. Lupack will explore the role of magazine illustration and editorial/political cartoons in defining and popularizing the notion of the “New Woman” of the turn of the twentieth century, whose emergence in fashion, art, and society helped to shape the careers of such female illustrators as Jennie Augusta Brownscombe, Jessie Wilcox Smith, Rose O’Neill, Elizabeth Shippen Green, and Violet Oakley.The work of these and others offer surprising insights into the age and culture, especially in the wake of the world war and the advent of the fight for women’s suffrage. The Narrative Tradition series is free for Museum members, or included with regular Museum admission. Parents and caregivers can enjoy our Thursday evening programs while their children are engaged in creative art and gallery activities inspired by the works on view. Children are free.